Context and Dependency Injection (CDI) tooling allows you to easily add and work with the CDI programming model for your web-based applications. 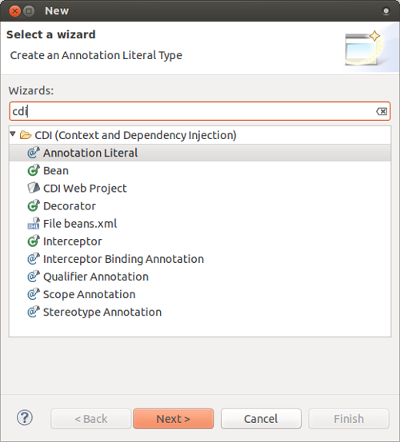 Helps you adding CDI support to existing projects and create new projects with the CDI wizard. 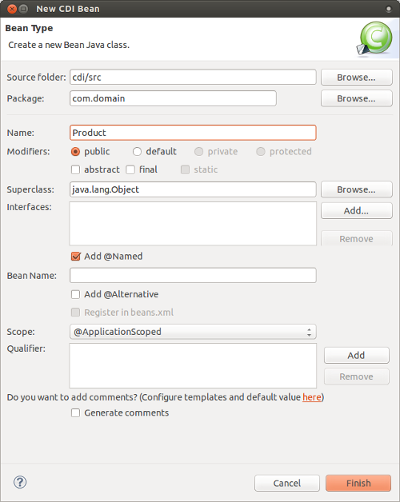 The tooling also provides you with validation, code completion and hyperlink navigation. CDI Tools validation covers most of the problems defined in the CDI specification. There are more than a hundred validation rules including definition errors and deployment problems. Some of the problems can be fixed via Quick Fixes menu (Ctrl+1). Hyperlinks help you to navigate between source files. 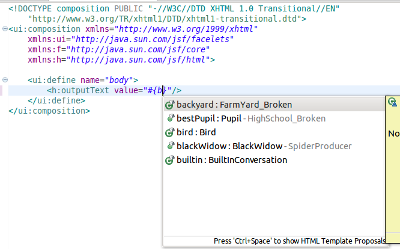 For example Ctrl+Click or F3 on any injection point will navigate you to the corresponding bean definition. If the injection point has multiple eligible beans, you can see a full list of these beans. Navigation also works in beans.xml. Observers, Events, Producer and Disposer methods can be navigated via hyperlinks too. 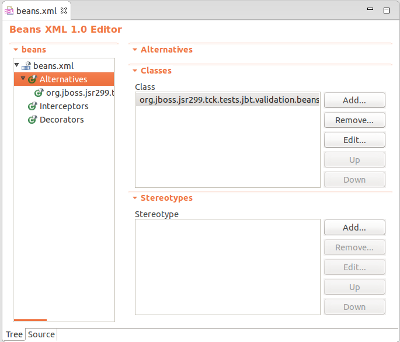 @Named beans and their properties/methods are available for code completion in XHTML files. 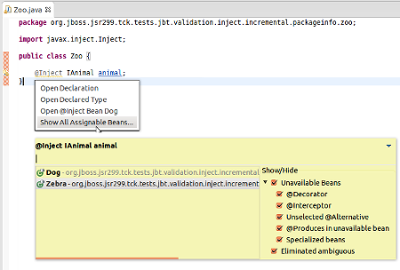 CDI Tools also supports validation, hyperlink navigation, refactoring for EL expressions.